I admit it. I am pumpkin-obsessed. I dream about pumpkin recipes, douse myself in the scent, and am counting down the days to go pumpkin picking with the fam. This simple recipe is a whole lot of pumpkin...but crazily enough contains no pumpkin...but a ton of pumpkin flavor! You must try these pumpkin spiced almonds. Line a baking tray with a silpat. Preheat your oven to 325 degrees. Mix the spices until well blended, then add vanilla and honey. Pour in the nuts and stir to coat. Spread the nuts on the silpat, and sprinkle the sea salt. Bake for 20 minutes and let cool completely before eating. 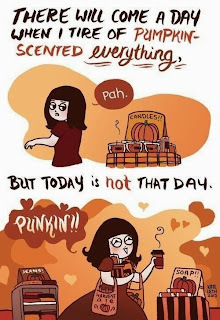 Breathe in, your house will start to smell of autumn fabulousness!!! Store in an airtight container, if they last long enough to store! A little mason jar of these gems with a mini pumpkin would be a sweet treat for any pumpkin lover!